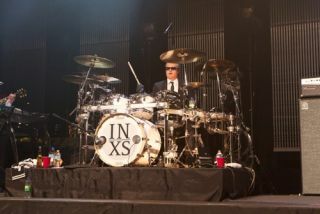 INXS have revisited their past with the new (or old depending how you want to look at it) album Original Sin. The record sees drummer Jon Farriss and co flicking through their back catalogue, laying down tracks from their past with guest vocalists. We caught up with Jon to get the lowdown on the record, as well as what fans can expect from the band's London show this weekend and what else is coming up for them. How did Original Sin come about? "The idea came about when we were jamming after not playing for a couple of years. We came off the road in 2007 and everyone had a bit of a break. So we jammed some old material and it was sounding really good the more we decided to experiment and destruct the older songs. We thought it could be a great project." Did it take a long time to put the whole thing together? "It was a long process. The entire project took about two-and-a-half years. There were a few reasons for that. Once we decided to invite in more singers to join the party they had their own suggestions and songs they loved. As more singers came onboard more songs were recorded and we just kept going from strength to strength." How did you approach the beats? Did you stay faithful to the originals or try new things? "The whole point was to re-record them in an effort to avoid them sounding like the originals. We'd already invented the original. We were re-inventing. In terms of the drums, in the past many producers wanted me to use vintage drums. There's a sound they offer that there's something special about. I approached Pearl and said there's always demand for vintage drums, could we put some custom drums together for me for recording? Pearl put together some beautiful mahogany custom drums for me. They recorded beautifully with a very soft, mellow tone." The first track is the 'Drum Opera', what was the thinking behind that one? "It was suggested to develop something like a drum opera so we could use it in our live set somehow. I went away and thought about it. I booked the studio and had a few ideas based around a stopwatch. It was also something I wrote for the 2010 Winter Olympics. It was a combination of roto toms, some interesting loops and sounds and things I recorded. It didn't take too long to get together. It's one of those where once you get into the groove, I was there like a mad scientist sitting at many different drum stations running from one to the next." "We're here for a one off show at Clapham Common then we're back to Australia and a North American tour. After that we'll be going in to some songwriting and moving onto the next phase."